The year is off to a busy start at CRU. We are pleased to attach a copy of the Dateclaimer for the first half of 2016. On one side you will see a list of workshops across the state. As is usual for CRU, each of these workshops will have a registration fee and each of these is open to people with disabilities, family members and people in paid roles. We hope to open registrations next week for our May conference “Claiming a Positive Future: The power of possibility”. We have some great speakers lined up and more information about them will be announced shortly. 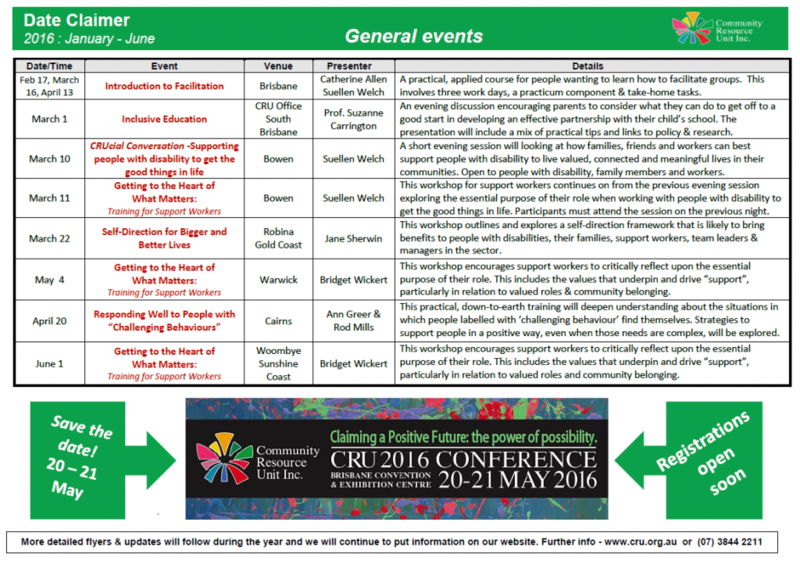 On the reverse side of the attachment is a list of the workshops that CRU will be presenting as part of our NDIS Participant Readiness Strategy, in partnership with Department of Communities, Child Safety and Disability Services. Our funding for this initiative was extended for the first half of 2016. These workshops are only for people with disabilities and family members. CRU will conduct workshops in the Brisbane, Central Queensland and South West Queensland regions of the state. These workshops will not have an attendance fee as they are fully subsidised by the Department of Communities. We are continuing to offer the Taking Charge of Change workshops as we did in 2015 and have added some new short sessions on different topics in the “Making the Most of the NDIS series”. I also encourage you to join us in early March to hear speakers from the trial sites in southern states share their experience of getting started with the NDIS. The first two events are in Toowoomba and Brisbane and we have plans to offer this soon in central Queensland too. The Mamre Association will be delivering the Participant Readiness strategy in North Queensland, Far North Queensland and North Coast regions www.pavetheway.org.au and YFS will be delivering workshops in the South East region. www.getready.yfs.org.au If you live in those regions we encourage you to sign up with YFS or Mamre to get further details of their workshops. The NDIA will be responsible for resourcing people who live in the early launch site areas. The Department will conduct a separate strategy to provide information for staff and workers in the sector. This is an initial date claimer for the first half of the year, to help you get these dates into your diary. Flyers are being prepared and will be sent prior to each event – they will contain details of the time and place of each event and how to register online via our website. If you have difficulty registering on-line please don’t hesitate to contact our office and someone will assist you with the process. We will require everybody to register for these workshops. We will continue to add workshops during the year. We encourage you to join our mailing list or follow us on Facebook so that you continue to hear from us. 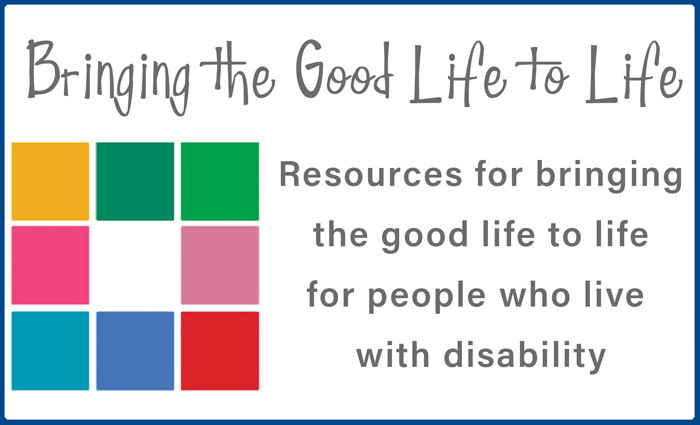 You can expect a few emails from us in the coming weeks – we are just finalising a new copy of CRUcial Times; we are about to launch a new website “Bringing the Good Life to Life” and registrations will be opening for the conference in May. We look forward to catching up at one of these CRU workshops in 2016.